Dec was a professional steehead guide for 14 years, now he fly fishes just for fun. Listen in to hear Dec's secrets to hooking up with the steelhead of your dreams. 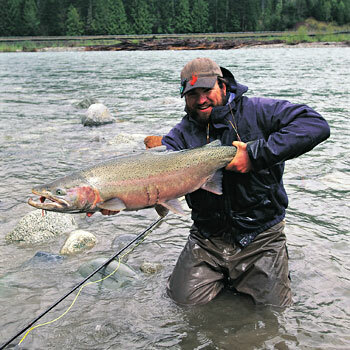 Dec was a full-time steelhead guide from 1989 to 2003 guiding fly anglers on the beautiful waters of the Skagit, Sauk, Skykomish, Grande Ronde, and Deschutes Rivers. He is a pioneer of two-handed casting in North America and continues to be a highly sought after spey casting instructor. As if one dream job weren't enough Hogan's had two: Dec has retired from guiding and is now a fulltime firefighter and EMT! Dec's schedule at the fire department allows him the time to stay active in his fishing career so expect to see plenty of Hogan in the coming years doing seminars and teaching fishing techniques and casting. In fact, he has just released a 4 hour steelhead fly tying DVD entitled Steelhead Flies Tying Classics which is available at www.martyhoward.com.